In a 2009 article in the Philosophical Transactions of the Royal Society, the French psychologists Sylvie Droit-Volet and Sandrine Gil described what they call the paradox of time: “although humans are able to accurately estimate time as if they possess a specific mechanism that allows them to measure time,” they wrote, “their representations of time are easily distorted by the context.” They describe how our sense of time changes with our emotional state. When we’re agitated or anxious, for instance, time seems to crawl; we lose patience. Our social milieu, too, influences the way we experience time. Studies suggest, write Droit-Volet and Gill, “that individuals match their time with that of others.” The “activity rhythm” of those around us alters our own perception of the passing of time. “A compression of time characterizes the life of the century now closing,” wrote James Gleick in his 1999 book Faster. Such compression characterized, as well, the preceding century. ‘The dreamy quiet old days are over and gone forever,” lamented William Smith in 1886; “for men now live, think and work at express speed.” I suspect it would take no more than a minute of googling to discover a quotation from one of the ancients bemoaning the horrific speed of contemporary life. The past has always had the advantage of seeming, and probably being, less hurried than the present. Still, something has changed in the last few years. Given what we know about the variability of our time sense, it seems clear that information and communication technologies would have a particularly strong effect on our perception of time. After all, those technologies often determine the pace of the events we experience, the speed with which we’re presented with new information and stimuli, and even the rhythm of our interactions with others. That’s been true for a long time — the newspaper, the telephone, and the television all quickened the speed of life — but the influence must be all the stronger now that we carry powerful and extraordinarily fast computers around with us all day long. Our gadgets train us to expect near-instantaneous responses to our actions, and we quickly get frustrated and annoyed at even brief delays. I know from my own experience with computers that my perception of time has been changed by technology. If I go from using a fast computer or web connection to using even a slightly slower one, processes that take just a few seconds longer — waking the machine from sleep, launching an application, opening a web page — seem almost intolerably slow. Never before have I been so aware of, and annoyed by, the passage of mere seconds. Research on web users makes it clear that this is a general phenomenon. Back in 2006, a famous study of online retailing found that a large percentage of shoppers would abandon a merchant’s site if its pages took four seconds or longer to load. In the few years since, the so-called Four Second Rule has been repealed and replaced by the Quarter of a Second Rule. Studies by companies like Google and Microsoft now find that it takes a delay of just 250 milliseconds in page loading for people to start abandoning a site. “Two hundred fifty milliseconds, either slower or faster, is close to the magic number now for competitive advantage on the Web,” a top Microsoft engineer said in 2012. To put that into perspective, it takes about the same amount of time for you to blink an eye. Every time a network gets quicker, we become antsier. “Every millisecond matters,” says a Google engineer. As we experience faster flows of information online, we become, in other words, less patient people. But impatience is not just a network effect. The phenomenon is amplified by the constant buzz of Facebook, Twitter, Snapchat, texting, and social networking in general. Society’s “activity rhythm” has never been so harried. Impatience is a contagion spread from gadget to gadget. All of this has obvious importance to anyone involved in online media or in running data centers. But it also has implications for how all of us think, socialize, and in general live. 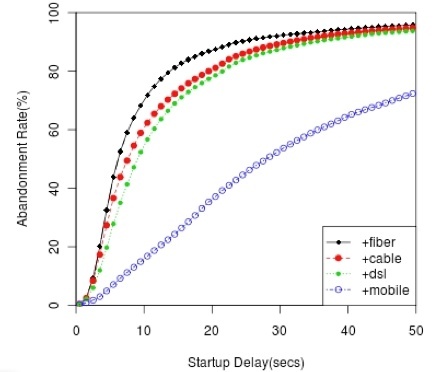 If we assume that networks will continue to get faster — a pretty safe bet — then we can also conclude that we’ll become more and more impatient, more and more intolerant of even milliseconds of delay between action and response. As a result, we’ll be less likely to experience anything that requires us to wait, that doesn’t provide us with instant gratification. That has cultural as well as personal consequences. The greatest of works — in art, science, politics, whatever — tend to take time and patience both to create and to appreciate. The deepest experiences can’t be measured in fractions of seconds. It’s not clear whether a technology-induced loss of patience persists even when we’re not using the technology. But I would hypothesize (based on what I see in myself and in others) that our sense of time is indeed changing in a lasting way. Digital technologies are training us to be more conscious of and more antagonistic toward delays of all sorts — and perhaps more intolerant of moments of time that pass without the arrival of new messages or other stimuli. Call it the patience deficit. Because our experience of time is so important to our experience of life, it strikes me that these kinds of technology- and media-induced changes in our perceptions can have particularly broad consequences. How long are you willing to wait for a new thing? How many empty seconds can you endure? Wow. I have been thinking a lot about this lately. I wonder how this is affecting children? I see in my students -grades 4 to 9 – what I percieve to be a growing lack of patience, as though our one-to-one computer classroom was always teaching them a disatisfaction with time (and maybe even reality) whatever else we believed they were learning. Yes, the consequences of this type of conditioning are very broad and none to pretty. Expectations of times needed for connection and completion vary by medium. A slight Internet delay may provoke abandonment within a second or two (I’m more likely to abandon something if I find it unrewarding), but a person stopping to select the right word in conversation does not cause discomfort. Similarly, with traffic in many cities, one simply shrugs and waits (or tries to go around on the shoulder). How all these interrelated timing expectations are changing daily life is an open question, and it will not be easy to quantify. But in term of the feel of my own experience, I’ve noticed that even when I’m in the midst of something enjoyable, I am impatient to be done with it, usually so that I can move onto something else. In the case of flow activity (which is invoked infrequently), I lose myself in time and am happy to occupy the eternal moment for as long as it lasts.